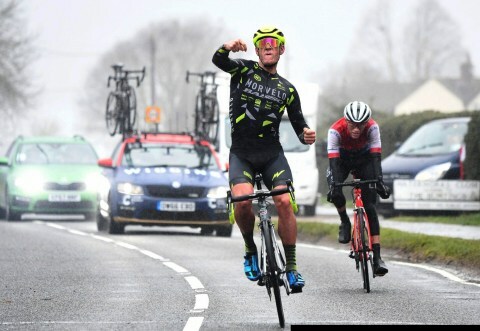 In 2018, winner of the early season classic, the Jock Wadley, Mikey Mottram showed that after racing for five or so years, he had what it takes to ride with the best in Britain. Now, in 2019, he will move up from an elite team to a UCI one in Vitus Pro Cycling. Speaking to Mikey at a team mini get together, he explained he had a good season in 2018. “I was getting in moves and showing potential in prems and the bigger races and decided it was now or never to move up a level. I know I am not coming into the team as a team leader or anything which is a big difference for me but it’s about taking on a big role in the team and doing a job which is quite exciting”. In 2018, Mikey had 17 victories including those on the track, and 44 podium places, again including track races. That’s a pretty cool record for one season. Mikey explained “I have won three or four Nat Bs and had a good run in some prems. I also got in the break at the CiCLE Classic and that was a big day out”. “Those performances give me confidence I can get results for the team and now I just need to focus on getting a good winter on the bike in and staying healthy and be ready come March to get going. I know it’s not about me going for the win and I may have a different role but I’m happy to do that”. The winner of the Jock Wadley in 2018, Mikey was also second to Tom Moses (Tour of Reservoir winner) in the Wally Gimber (another early season classic). He also won the Chitterne Road Race outfoxing a ‘name’ in Marcin Bialoblocki. With performances like that, Mikey has proven he has both the hunger and the legs under him to do well in the races and we wish him well with Vitus Pro Cycling in 2018.